If the young painters were to learn by studying themselves, if they were helped to take possession of their reality as Man - physiologically, to begin with - then I am quite sure that those who are tempted by what is called 'abstract' or 'non-figurative' painting would know all the better how legitimate this aspiration is. They would know to what it corresponds, and how human it is, since, already, they would know that the reality of colours belongs to their eye - their sight - and that the green of a tree, or the red of a flower, are neither in the tree, nor in the flower, but in the act of seeing. It is the act of seeing that makes the chromatic scale, which orders its course, its life, its movement, which makes it a gift to the man become painter, so that, in combining all its possibilities, he can, through his song, enchant his eyes, his heart, and his spirit which is light, and the eyes, the heart, the spirit of his fellows. But this education of Man and of the painter, where does it take place these days? Where is Man taught once again to centre himself on his own bodily reality? Where is the painter told that the laws of his craft are the laws of his own eyes? We still continue to keep Man at a great distance from himself, and, alas, we do it in all good faith. As for the painter, we persist in directing his attention on everything that is not of himself. We talk to him wrongheadedly about all sorts of things which keep him from becoming aware of his role, of his mission. We introduce him to the classical masterpieces which, whatever else might be said about them, are a distortion of his craft. We worry him with this and turn him into a tormented soul, a copyist, or a rebel. This is revealed in the present state of what is called the arts. It is the result of compromise, of falsifications, of a definite lack of courage in declaring in favour of the painter's eye, master of form and colour. The chromatic scale was not made by the eye for the mere purpose of filling in the details of an anatomy or of a landscape, but in order that the combinations to which it lends itself, and which are in harmony with the different levels of human nature - that of space, accessible to the senses, and that of non-located time - should be transfigured in light. Light-rhythm, which the painter will not find outside himself, but in himself, in being born, in growing with himself. It is by means of the chromatic scale that the eye has produced colours. It has endowed its own movement with variety by means of a succession of tones that are, in themselves, clearly distinguished but linked together through a series of imperceptible undulations. Where in all that will the physicist find any leaps or jerks? What will he find that is indeterminate? Can he see anything there that will support his imprudent assertion: that nature detests exactitude and precision? On the contrary, the chromatic scale - the scale of time, as it is derived from movement-in-itself - perpetuates and adapts itself without any surprises. It is, clearly, determined in its course. It is precise and rigorous. It is formal, and that is why it is circular. It is universal, unus vertere, the one that turns. To express it in a rectangular diagram, as is done too often, is to distort its nature, to strip it of its living shape, to tear it away from its visual source and deliver it up to an intellectual sacrilege. The eye is round, and it turns round, and it is the eye, and only the eye, that responds to roundness and to the development in the curve of the chromatic scale, where all is order and beauty. The eye has made the chromatic scale because it is an organ of light. This prerogative was acknowledged in the past. Closer to our own day it was challenged, and the eye was recognised only as an organ capable of receiving light, which latter was understood above all, in the sense of illumination. I think that, today, we must go back to the original way of understanding it - visibility pre-existent to the visible, as light transcends the obstacles that bear witness to it, as life is greater than the organisms in which it is revealed. The eye only reflects the illumination that comes from the sun because it is in intimate union with light itself, as movement in time is only the sign of movement in itself, as the circle traced by the compass is only an imitation of the real, transcendent circle. The necessity of a support as a precondition for every intellectual demonstration is strongly affirmed as one of the axioms, those articles of rationalist faith. All the more reason, then, to assert the necessity of a transcendental support, which is yet more indispensable if objective - living - reality is to be understood. Since Humanist man has reduced himself to nothing more than a mechanics of observation, it is not surprising that, following on his premisses, he has mechanised everything about him to such an extent that he has forgotten the starting point, the mechanisation of himself, the fundamental axiom. From here to the belief that nature is a mechanism, it is only a step. This step has been taken with regard to light, and with regard to the eye, a simple apparatus for seeing clearly, a receiver, which never gives anything. Nor have we failed to replace the eye with means that, so we imagine, are more suitable for informing the observer on the nature of light, at least of the light of the sun. And, by means of analysis, we have convinced ourselves that this light is composed of a bundle of luminous rays. Luminous rays that, of course, have nothing to do with the participation of the eye, just as perspective, a science in itself, has nothing to do with anything other than our own intellectuality. With the help of clever means of representation, imagination, a lack of good sense among the general public, and of faith diverted from its proper object for the benefit of science, we are convinced that we have acquired hitherto unsuspected certainties about the nature of light. In fact, all our efforts have been directed towards the mechanised eye, in a fixed, frozen, state; and it is only this mechanism that has been studied through its consequences, which amounts to no more than a simple subjectivism which has nothing to do with the object - light. So we imagine a bundle of luminous rays without that which is responsible, the eye in certain conditions, which is replaced by a perforated screen that is supposed to imitate its constitution! Truly we have taken the effect for the cause itself, the illusion of perspective for the reality, the impression that we experience for the object - that object which is, successively and relatively, at rest and in movement. Let us go still further and imagine the possibility of a blind physicist studying light. The absurdity becomes obvious, and no-one can miss it. It comes down to this - that the eye counts for something in this would-be study of Light, and we have the right to ask: do these hypotheses and descriptions which are proposed with respect to light derive from the light itself or do they derive from the eye? Or from the eye abstracted from its true reality? In fact, the man who refuses to know himself and who gives himself up naively to his perceptions, hoping to gain knowledge of the sum total of these perceptions which he calls the Universe, is certain to fall, inextricably, into the swamp of his own contradictions. The mechanical eye is capable only of perception. But, living, the eye is something quite different. If it receives external traces of light, it is because it possesses light itself, implicitly. That is a perfectly reasonable postulate. It does not emit light. One does not emit reality, which is not subject to space and time. But it is, mysteriously, united with light and it proves it by, in a way, translating it spatially and turning it, temporally, localising it and then restoring its mobility through periods, cadences etc. ... according to the two natures of Man. The eye is a generator of light, and it is this generation that is shown in the chromatic scale. It is a renewal of the struggle to gain a definitive victory over that light which is beyond our knowledge, and the proofs of this struggle remain as colours in a precise order, which the eye has been unable to conquer, but which it has, nonetheless, taken prisoner. The discovery of the chromatic scale has been attributed to Newton. But this is, surely, a rather hasty judgment. It would be closer to the truth to say that Newton rediscovered it after it had been forgotten. 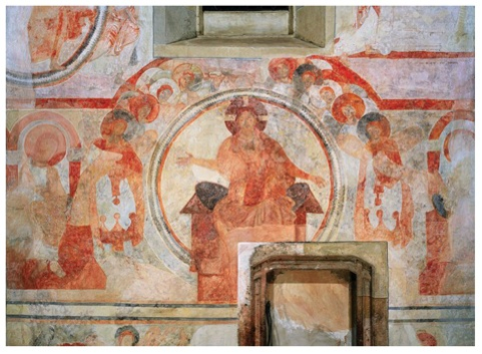 For we only have to study and come to understand the two great models of mediaeval sacred painting - the Christ in Glory and the Virgin in Glory (or in Majesty) - to realise that the key to their understanding is the rainbow, the chromatic circle. In my work, Homocentrism, or The Return of Christian Man, I also point to the use of the rainbow that is recommended to painters in the Mount Athos Guide to painting. And I recall that it is not with the intention of producing a literary metaphor that in Genesis Ch.IX, vv 11,13,16,17, the rainbow is introduced as the basic witness, the intermediary between transcendent light and isolated, localised, embodied light. I stress 'embodied' and not perceived, real in its relativity and not at all simple appearance. But the classifications are so exclusive that a scientist cannot let them go. It was Newton who invented the rainbow, and our scientist cannot admit that, a long time beforehand, it was used by painters to bear witness to this light which has, for him, become a hypothetical theory. First of all, can painting have any connection with science? Nowadays we know of course that it can't, that it is only a superfluous luxury without importance, that it is based only on the sensibility of a particular personality which can express itself all the better the more it is stripped of reason. And, since we are in a constant state of progress, what good purpose can be served by asking questions about the painted works of other times, which, unquestionably, can only be inferior to those of the present day? At least, that is what we think, even if we don't say it openly. And it is certainly the misfortune of our age. The chromatic circle is the key to harmony, but, much more importantly, it is the key to melody. We must turn to it if painting is to become painting. Delacroix wrote that 'painting does not always need a subject', thus anticipating the aspirations which have become urgent at the present time. Let painting, then, become subject to its own object! Let the painter become conscious of himself, of his eye which, humanly, makes the painting. I think that we have now easily understood that the chromatic circle becomes movement when it is allowed to do so by the eye. By the same token, we can understand that this movement can be stopped simply by stopping the eye and that in this way it becomes a colour-harmony - an accord. It can also be stopped if its periods are situated, given a precise location, isolated, one from the other. That is how colours are arranged on the palette, waiting ... They have, for all practical purposes, been realised once each tone has been brought to a particular limited degree of saturation. The painter's role, then, begins with putting these colours qualitatively and qualitatively in relation with each other in such a way that they achieve a harmony. That, as I have said, is the function of the eye in translation. Various efforts have been made to use the chromatic circle to realise harmonious effects that will be sure and certain. An equilateral triangle has been used, on a pivot, whose points, when they are fixed on a large chromatic circle, should indicate, without fail, triads of colour. An English chemist has even devised a sort of code of colour harmonies, a prescription formula for the use of colourists. All that is more or less futile. In truth, all the possible relations of colour are valuable - none can be ruled out, so long as the master of harmony is involved, the eye at rest, who establishes the relations that should prevail in each of the particular localities. It is here that sensitivity, taste, the feeling of quality, and also inventiveness, can and must reveal themselves. The rule can do no more than enable us to understand and to confirm the rightness of the feeling. Feeling precedes the rule, reason. Feeling [sentiment] is a very different thing from sensibility [sensibilité] with which too often it is confused. Sensibility is a mechanical irritability, while feeling is a sympathy, or antipathy, that is revealed. The sensibility of the eye is not peculiar to itself. It is a reflex reaction common to all the parts of the body. But its feeling is its own. This is proved by the path traced by the colours on the chromatic circle. The feeling of sympathy that blue bears to yellow and vice versa is rendered visible by their coming together, which is green. There is, flowing about the colour circle, a whole current of feeling and of sympathy. Reason has not failed to understand this and - with a view to rendering these affinities of practical use, to adapt them to the mysteries of the painter's craft - it has distinguished three fundamental colours, from which all the others are derived. They are blue, yellow and red. The young painter must know them and know from whence they come. With these three colours, he will make all the others. To have these three primary colours at his disposal, as well as a white and a black to vary their tonalities, that is all that is needed to satisfy the needs of the eye and, therefore, of the painter. Today's palettes are too overloaded with a host of colours as parasitical as they are violent, which falsify the instinct of the true colourist. This overloading is probably an attempt to compensate for the destruction of the resources of the craft which the painter has, knowingly, accepted because he thinks that there are advantages in ignorance. He wants to scream because he no longer knows how to sing. In a real workshop, one that would be worthy of the name, an apprentice painter would, for the purpose of knowing colour, be subjected to a course of study that would complement the study of drawing. Everyone, we have said, has, more or less, the feeling for harmony, which indicates an irrational, metaphysical presence of the truth of colour. The future painter, however, who is not just anyone, must develop this feeling. It is through experience that he will manage to give it its full force, and to vary the different ways in which it is revealed. This experience will demonstrate the existence of rules which cannot be avoided and which he had better acknowledge so that he can become their master and be able to put them to use without having to think about them. When once we have learnt our craft correctly, it becomes impossible to lose contact with the 'object' because we make it, and, in this way, we avoid confusion with the subject. So, we come to see that the object is lovely in its reality, and that it is sufficient in itself. If we admire an old cupboard, it is not so much because it is a cupboard as because it is a beautiful object of carpentry. The practical side is infinitely less important than the objective fact, the more so because the practical needs of one age differ from those of another and, so far as that is concerned, what suits one time may no longer be suitable for the next. The object is permanent because it is a reality in itself and because its successful realisation is synonymous with beauty. If we think about it seriously, we are obliged to admit that this traditional nature of the object has been entirely forgotten, that we are, now, more and more attached to what is perishable, instantaneous, and of mediocre interest. Overcome by technology, we only talk of the object's 'function', in other words, its practical utility. We only pay attention to the 'cupboard-function', and we abandon ourselves to wearisome efforts to satisfy it. This tendency of the soul today predominates everywhere, and over everything, and ends up in irritating results - in things that leave us feeling ill at ease, in weirdness, the disappearance of the quality of our manual work, at the same time as that of the materials which we use. The 'function' is the 'subject', and if we place all our sense of the importance of our work uniquely in this utilitarian motive - a motive which changes according to everyone's point of view - then we lose sight of what is essential, the object. A cupboard is made to hold an infinite variety of things, certainly, but the object we are looking for is the cupboard and it is on that that the carpenter must concentrate his attention while he is making it. We thought of this in the past, and thought well. The admiration which we feel at the present time proves it. The subject, the function, is of little importance to us, since, truth to tell, we feel more at our ease even on a practical level with these old articles of furniture than with those of our own time, in which some clever designer has thought to put everything together, in which every detail is predetermined, and on which a precise function and even a precise situation have been imposed.